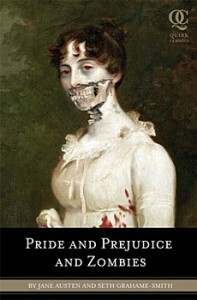 Pride, Prejudice and Enough Already! This, of course, comes on the heels of Pride, Prejudice and Zombies; Sense, Sensibility and Sea Monsters; Emma and the Werewolves; and Mansfield Park and Mummies. While a Austen/Bronte-meet-ze-monster book may have been a clever idea at one point, I just can’t imagine that the concept is worth sustaining a whole speculative fiction cottage industry. This entry was posted in Uncategorized and tagged austen, bill crider, bronte, locus, sea monsters, vampires, Zombies by sanford. Bookmark the permalink. Thanks for shedding light on this. I wish you well with the book, and I’m sorry to hear about your financial and family problems. While I’m still puzzled why this particular mashup genre continues to thrive, it sounds like you had fun writing the book, and you certainly deserve to reap the financial reward from your work. Thank you for the kind words, Sanford, and best of wishes to you also. Did not mean to put you on the spot, and I do understand your sentiments, but it has been very frustrating seeing this kind of reaction, as you can imagine. Thanks for listening, and all my best to you.